I’m not a big fan of microwave cooking, but when I saw this recipe, I couldn’t resist trying it. I go for a walk every morning before the kids wakeup. Sometimes, my Little Blessings wake up and get hungry before I get back. Since The Bigs (well, Mary Michael anyway – Jack’s summer job has him out the door by 7:30) is inclined to sleep until 9:00 or 10:00, this leaves The Littles to fend for themselves. Now, I’m not above leaving a loaf of bread and a jar of peanut butter on the counter and letting them have at it. But since we are chicken farmers, and since we have an abundance of eggs, I also like to push eggs for breakfast (and lunch and dinner). 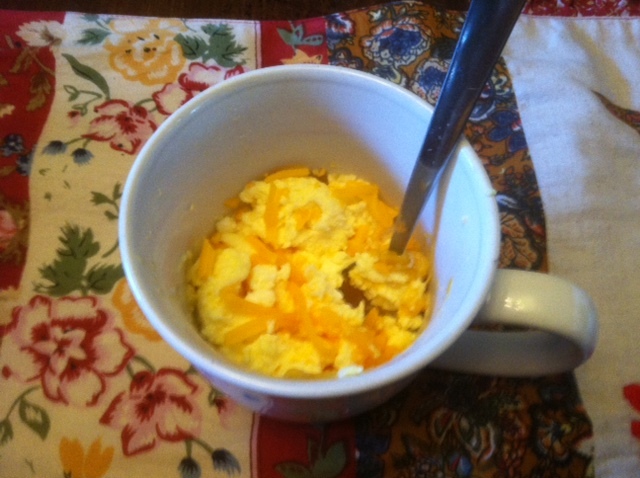 This recipe allows The Littles to have hot, cheesy scrambled eggs for breakfast without turning on the stove – or bugging me. It’s a win win! In a coffee mug mix two eggs and two tablespoons of milk. Microwave on high for 45 seconds. Stir then cook for another 30-45 seconds until the eggs are set. Sprinkle with cheese, salt, and pepper. Enjoy!